- Size: Approx. 35 * 29 * 0.2cm/ 13.8 * 11.4 * 0.08 inch(L*W*H). 【High Quality】:Soyee 13.8 by 11.4inch artificial palm leaves are made of environmental protection material with soft touch and waterproof feature,it is not easy to be destroyed,durable and reusable. 【Multipurpose Function】:You can DIY the palm leaves into the placemats ,table runners or other party supplies. 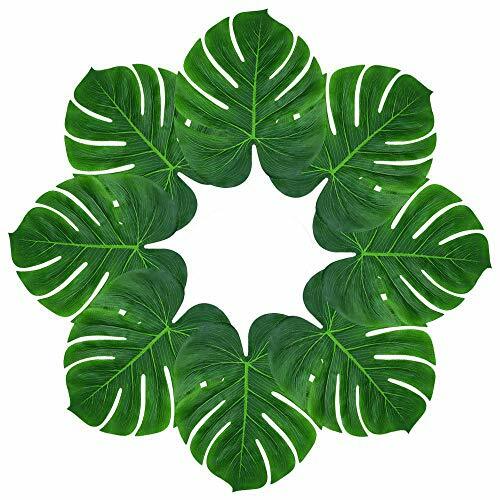 【Creat Amazing Atmosphere】:Place the palm leaves into table, matched with other tropical plants, or hibiscus flowers and Hawaiian leis to create an authentic tropical island atmosphere.Everyone will be loving your parties when you add our Palm Leaf Table Décor or laua wedding reception . 【DIY REALISTIC TROPICAL THEME PARTY】: DIY a fresh stunning tropical party with realistic tropical leaves and other centerpieces or existing landscape to make your guests feel like in an authentic tropical island paradise. If you have any questions about this product by Soyee, contact us by completing and submitting the form below. If you are looking for a specif part number, please include it with your message.